Heat oven to 325°F. Spray cookie sheets with cooking spray. In 2-quart saucepan, heat butter and 1 cup of the chocolate chips over low heat, stirring occasionally, until melted. Remove from heat; stir in brown sugar. Cool slightly, stirring occasionally. Stir in eggs and vanilla. Stir in flour, cocoa and salt. Stir in remaining 1 cup chocolate chips. Onto cookie sheets, drop dough by tablespoonfuls about 2 inches apart. Bake 10 minutes or until almost set. Cool 5 minutes; remove from cookie sheets to cooling racks. Add a powdered sugar stencil design on top of cookies to dress them up for the holidays. Serve warm with a tall glass of milk for the ultimate afternoon treat! These brownie cookies feature the best parts of a pan of brownies — the dense fudgy middle pieces and the crisp crunchy corners — in every single bite. Plus, you don’t need to fuss over what size pan to use. All you need for this recipe is a cookie sheet! This scratch recipe may have a couple extra steps, but these cookies are worth the extra effort. What’s the secret to this cookie’s decadence? It’s the rich, chocolate mixture that’s made on the stovetop. Chocolate chips and butter are slowly melted, creating a chocolate slurry base for the rest of your ingredients, which guarantees a dense and chewy cookie. 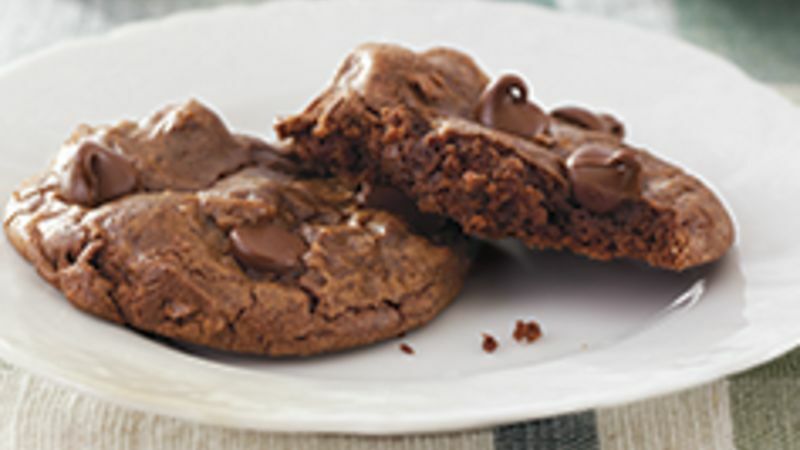 And after you’ve mastered this brownie cookie, try some of Betty’s other brownie cookie recipes. You’re sure to find the one that’s perfect for you among Betty’s extensive library. Before getting started, beginners or anyone who wants to perfect their baking skills should check out Betty’s cookie cheat sheet. It’s got all the tips you need to bake the perfect cookie every time!